Peel and grate the potatoes and onion. Mix together the potato, onion, minced meat, and then add the egg and seasonings. 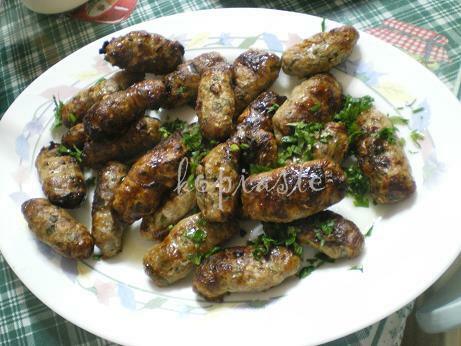 When it is well blended, form into 7cms, sausage-like rissoles (or, if for a party, into small inch-large balls), roll in flour and fry in plenty of well-heated fat until golden brown. 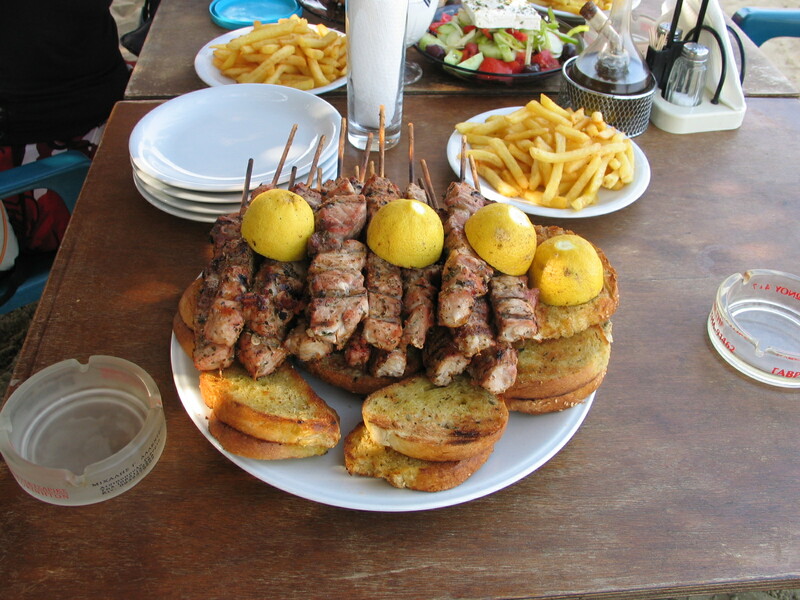 The best souvlakia are made from the leg of mutton, the tail of the sheep being used for fat. 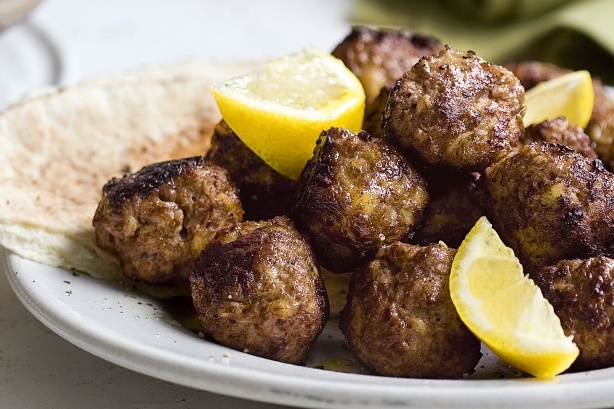 Any other fat is not as nice, but you can also make souvlakia from pork or veal. First of all you must go to an ironmonger and buy a “psistaria”-barbeque, and spits-“souvles” (large skewers), as well as charcoal which you buy ready made up in one or two kg bags. The back yard is the best place to light your charcoal fire. Pour a little kerosene over the coals, or a few sticks or paper crushed into balls, to help kindle the fire. A piece of cardboard can be used as a fan. Cut your meat into inch-sized cubes and, if you like, drive your skewers through an onion before putting the meat on to them. Put 2-3 pieces of lean and one piece of fat alternately on the spit, repeating the process until you have about eight pieces on each. Sprinkle the pieces with salt just before putting them on the fire. Cook on a low charcoal fire turning them frequently so that they get cooked all over but remain nice and juicy. Serve immediately. On the table you should have chopped parsley, and lemon to go with it. Souvlakia are also served with yoghourt, radishes, spring onions and fresh local bread or “pittes”, which is a special bread pocket into which the souvlakia are put at the street stalls. 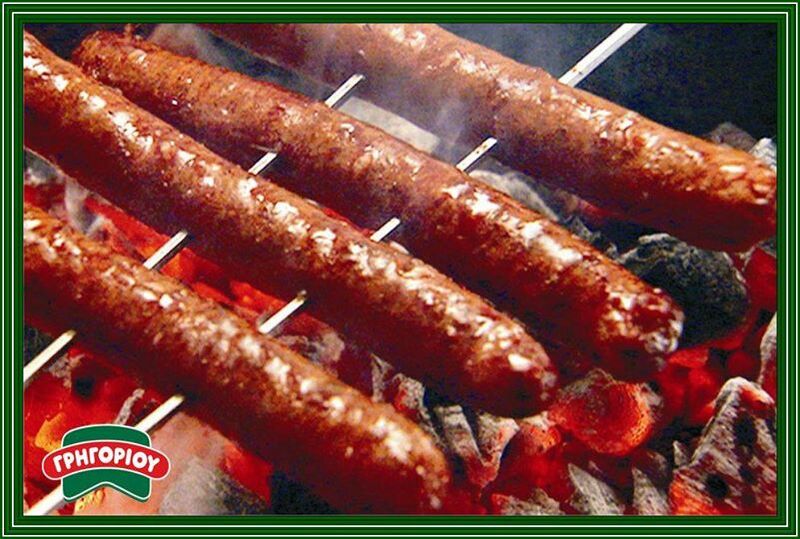 These should be warmed through over the charcoal while you are cooking the souvlakia. Very often referred to by the people who sell them as “sausages” ! Cut the panna roughly into 10 cms squares and put about 1 tablespoon of minced meat filling onto it. Roll up into an oblong sausage-like package, folding over the sides first and then rolling it up to make a five cms long each sheftalia meat pieces. Pass a spit through four or five sheftalia and grill them on a low charcoal fire until they are thoroughly cooked and brown. They tend to burn on the outside and be raw inside, so turn them frequently until ready to serve. 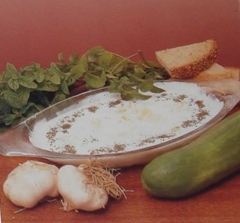 Chiromeri is one of the best Cyprus “mezedes” and very popular among Cypriots because of its excellent taste. The preparation requires about sixty days and it is usually done during the winter. 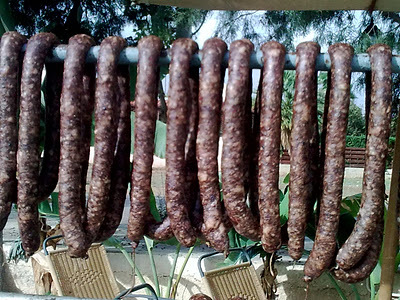 The secret for preserving “chiromeri” is salt and you must pierce the meat with a long spit to allow wine and salt to be absorbed in the meat. It is served cold, cut in oblong pieces and in restaurants and bars it is served as an appetizer. It can also be served hot, cut in small pieces and fried with eggs. Take the skin and the excess fat from the back leg of the pork. Sprinkle with dry red wine and add a thick layer of salt. Put it in a big pan and cover with red dry wine. Press the leg with something heavy so that it is always in the wine. Every four days turn it onto the other side and shake the wine at the same time. It must remain in the wine for 30 days. After the 30 days take it out of the wine and hung it over the fire place or in a warm area for 2 to 4 days until it becomes smoked. Then remove it and place it under a heavy pan for two days in order to take its thin shape and reject its water. Then hung it over the fireplace again for 15 more days. It can be preserved and consumed for a year or more afterwards while kept in a cool place. One more delicious “meze”. Its preparation is almost the same as that of “chiromeri”. The fat and the meat of the pork are used. Chop the meat into small square pieces and put into red dry wine for about 10 days. Add the intestines of the pork which must first be well cleaned and rinsed with vinegar. When the 10 days are over, take the meat out of the wine and sprinkle with salt, black pepper and crushed coriander. The intestines are filled with this meat and they are hung over the fireplace or a warm area to be smoked and drained. They must either be kept hanging in a cool place or slightly fried and then put in clay jars covered with melted pork fat. They are always served hot, cooked on charcoals or fried with eggs. 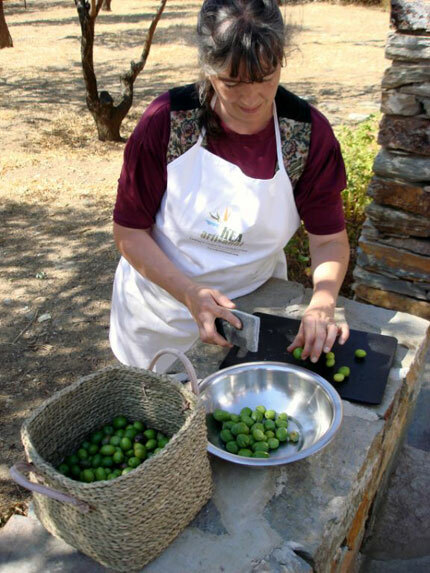 Wash green olives and then dry them in the sun. Beat them gently with a flat stone to split them. Put them in a large jar and add cold water to cover them and for the next six days keep changing the water. Then dissolve salt in water (about half a tsp of salt per cup of water) and cover the olives. Add the juice of 3 lemons to the salted water and pour half cup of olive oil to the surface. Store the jar in a cool place. To serve olives, wash them to remove salt and pour olive oil beaten with lemon juice over them. Add some crush coriander and some crushed cloves of garlic. Please note, to ensure that the water has the right amount of salt, put a fresh egg in it until it floats with small part of it coming above the water line. Put the sliced cucumber in a bowl and sprinkle with salt. Let it stand for about half an hour and drain the excess water. Put garlic in another bowl and mix it with olive oil and vinegar. Add yoghourt little by little and stir at the same time until it becomes smooth and creamy. Take the cucumber bowl and mix with yoghourt. Serve in small plates and sprinkle with a few drops of olive oil and dried mint.